Why are Ancient Sites Aligned? Ancient sites are located where they are for very deliberate reasons, and a range of factors is involved. On this page are details about alignments and how they determine the location of many ancient sites. In subsequent pages, further details are outlined. The first known mention of alignments was by archaeologist William Henry Black in 1870, but they came to wider attention in 1921 through Alfred Watkins in his books Early British Trackways and The Old Straight Track. Later, they came to wider attention in John Michell's seminal 1969 book View over Atlantis - historian Prof Ronald Hutton called it "...almost the founding document of the modern earth mysteries movement". 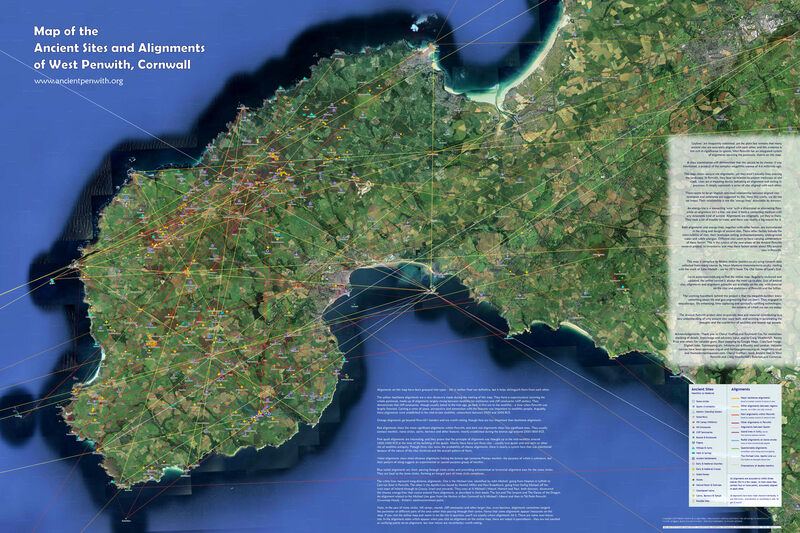 To illustrate his point about leylines, Michell sought out an area in which to do a more systematic study of alignments in one single district, choosing West Penwith and writing about this work in his 1974 book The Old Stones of Land's End. (Listen to an audio talk by him here.) He was helped by a number of people including Cheryl Straffon, then a recent Cambridge archaeology graduate with alternative leanings. After that time, ley-hunting flourished as a layperson's area of research, firmly rejected and at times actively discredited by the archaeological establishment. Despite this, the idea lives on because it is rich in incontrovertible evidence - as is shown on this website. The map of ancient Penwith shows what we know of the geomantic system of the far reaches of West Cornwall, as laid out around 4,000 to 6,000 years ago in the neolithic and bronze ages, with additions in the iron age and early medieval period. We do not understand exactly what the ancients intended or why, but the evidence that they located ancient sites in accurate straight alignments suggests that they knew something about the landscape and its management that perhaps we need to find out today. The people of the neolithic and bronze ages demonstrated a developed knowledge in engineering, logistics, astronomy, mathematics, architecture and ecosystem management. By investigating alignments we can gain some access to the ideas of the megalith builders of thousands of years ago, with a view to recovering some of what they knew and understood. They had thoughts and a cosmology of their own, and accessing these requires bending our modern ideas to see and experience things more in their way. They did not build prehistoric sacred sites in ways that we moderns easily understand from our rational-scientistic viewpoint. Something more intuitive, sensitive, magical, imaginal, poetic, experiential and a-rational is needed, since the ancients' worldview has a logic of its own. 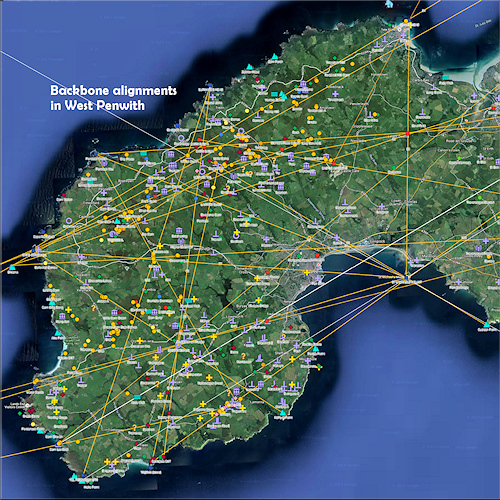 On the Map of Ancient West Penwith we are dealing with alignments between ancient sites, not with energy-lines that dowsers and sensitives pick up. These two are different and should not be confused. An alignment is simply a series of sites that are aligned with each other, while an energy-line is a detectable current in the landscape connecting different sites - detectable by dowsers and sensitives, that is. However, alignments are evidentially sound: one does not need special sensitivities to identify them since they can be found, measured, marked and compared on maps. The data are reproduceable and verifiable. Sometimes alignments and energy-lines seem to coincide and in many cases they do not. Yet both contribute to the geomantic wholeness shown in the patterns of ancient sites in the landscape. Both play a part in determining the location of ancient sites. Ancient sites were located very deliberately, not just randomly in pleasant places or wherever their builders fancied. With a few exceptions, they are almost always aligned with other sites, and these alignments are decidedly accurate and intentional. (Many of those exceptions might arise because some sites have been destroyed or moved.) They are not pathways or trackways, and only in some cases (perhaps 20%?) are sites visible from other sites with which they are aligned, so sites cannot be interpreted as simple way-markers. The picture above shows how Chûn Quoit is exactly profiled on the local horizon, as seen from Boswens menhir. From the quoit, the menhir is visible but not so easily seen - so this is a one-way visibility issue, and a classic example of intentional visibility of one site from another. Many sites have a distinctly strong, palpable and atmospheric feeling to them - and also they vary greatly in quality and tone. But here arises a question. The working hypothesis in geomancy is that most or all ancient sites are located where they are because of the inherent natural energy-qualities of that place - genius loci or 'spirit of place'. Another working hypothesis is that the construction of stones or cairns on the site was done to enhance, entrain and harness those qualities. There's a third factor too, called place memory - the energy or memory traces of things that have happened and people who have been there over time. Now comes a chicken-and-egg question. If a straight alignment has four, five or six sites on it, does this mean that the inherent atmospheric place-qualities at those locations were already naturally arranged in a straight alignment, before the sites were developed by humans? Is this a pattern of nature? Or do man-made constructions such as megaliths attract energies to themselves, drawing available energy-fields into geographically straight alignments, thereby cultivating a man-made order that was not originally there? The answer might lie in a mixture of both options: some sites might be natural energy-centres enhanced and amplified by humans, while others seem to be man-made energy-centres that came into being because of human intervention inducing a response from nature. In the bronze age there are also signs of sites being constructed for theoretically-based reasons - 'megalithic science' - to link other sites, mark soli-lunar rising and setting points or perhaps even to fulfil quite arcane sacred-geometrical or mathematical aims. It might be true that, with sites that have an inherent 'reality-field' that pre-existed human intervention, there is a degree of geographical order to their locations. Meanwhile other sites might have been placed as 'relays' in alignment with them, or to form complexes around stone circles. These sites would draw such reality-fields to themselves from the surrounding environment to localise and concentrate them in chosen places, forming a greater pattern and coherence across the landscape. It has indeed been the experience of modern-day builders of standing stones, labyrinths and other outdoor shrines (such as my old friends Sig Lonegren and the late Ivan Macbeth) that dowsable energy-fields in the vicinity migrate to them - moving at least short distances such as 100-300 metres to relocate under the site. This is the overall observation and understanding of modern geomancers, and it is an area where more research and experimentation is needed. But the main point here is that ancient sites are established in connection with localised concentrations of subtle energy, reality-fields and consciousness-bubbles. This is fundamental. Without this, few plausible reasons can be found as to why the neolithics and the bronzies went to so much trouble to build their sacred sites - except perhaps superstition, delusion or ignorance which, from the evidence in the field, seems unlikely. This is an area where modern science and archaeology choose not to tread. This needs to change, because it represents a major evidential gap in their analysis of ancient sites - an elephant in the room. Soviet scientists edged into this area of research in the 1960s-80s - they called it psychobiophysics. Top Soviet research establishments were involved. They saw energy and matter to be outcomes of a wide spectrum of energy-frequencies rather than seeing them as being made up primarily of atoms and sub-atomic particles, or things. Thus they had a conceptual framework with which to research what we might call parapsychological subjects such as subtle or invisible energy or the relationship between matter and consciousness. Subtle energy was thus intellectually or scientifically permissible and evidential to Soviets, while this was not so in the West, and this situation in the West continues today. As a result, issues such as the effect of man-made electromagnetic frequencies on animals, water, the human body and even climate change are dangerously missed. So, a fundamental working principle in geomancy involves subtle energy, dimensions of reality, consciousness and the intelligence within nature. One purpose of ancient sites was seemingly to work with both energy and consciousness to infuse nature and reality with a kind of order. Arguably, ancient sites were built not only to give humans uplift, but also to bring out what ancients saw to be the best in nature and to enhance its inherent strengths, fruitfulness and balance. These therefore represent subtle-energy technologies that we might learn something from today. Prehistoric people seemed to work with a sort of deep-rooted civil engineering which, on this website, is suggest to be a kind of geoengineering to affect the natural environment, the climate and the fortunes of humans. Nine Maidens stone circle, Lanyon Quoit, Boscawen-ûn stone circle and Treryn Dinas cliff castle are all exactly aligned. These are four key sites in Penwith. Boscawen-ûn stone circle is aligned with St Michael’s Mount in one direction and Maen Castle and the Bonfire Carn on South Hill, Bryher, in the Isles of Scilly, in the other direction. Meanwhile, Lanyon Quoit is exactly on an alignment between St Michael’s Mount and Pendeen Watch - both of them prominent cliff sanctuaries. By mentioning just these three alignments, the beginnings of a locational order in West Penwith begins to take shape. Sites such as Boscawen-ûn and Lanyon Quoit are very deliberately placed into a wider network anchored to the cliff castles and neolithic tor enclosures. Thus these alignments are neolithic in origin, since the tor enclosures, Lanyon Quoit and the cliff castles are neolithic too. 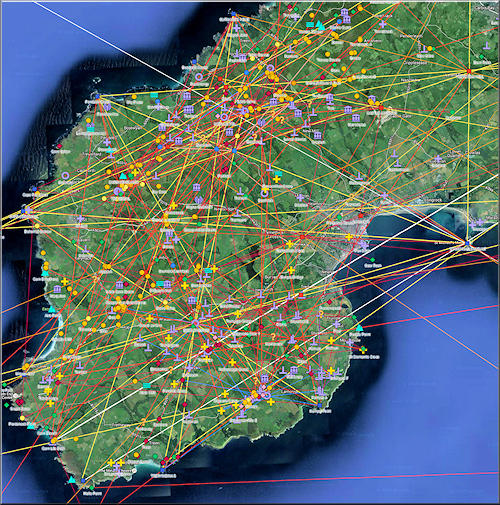 The ancients had definite reasons for locating sites where they did. The hills and the coastal headlands of West Penwith, key features in the landscape, serve as the anchor-points for the backbone alignments system. St Michael's Mount, Boscawen-ûn, Trencrom Hill, Botrea Barrows and Lanyon Quoit are its main nodes. The foundations of Penwith's alignments system, the backbone alignments, were laid down somewhere around 3700 BCE in the mid-neolithic. This is evidenced by the key position Lanyon Quoit plays in the backbone system, and by the fact that the backbone system caused Lanyon Quoit to be positioned where it is. 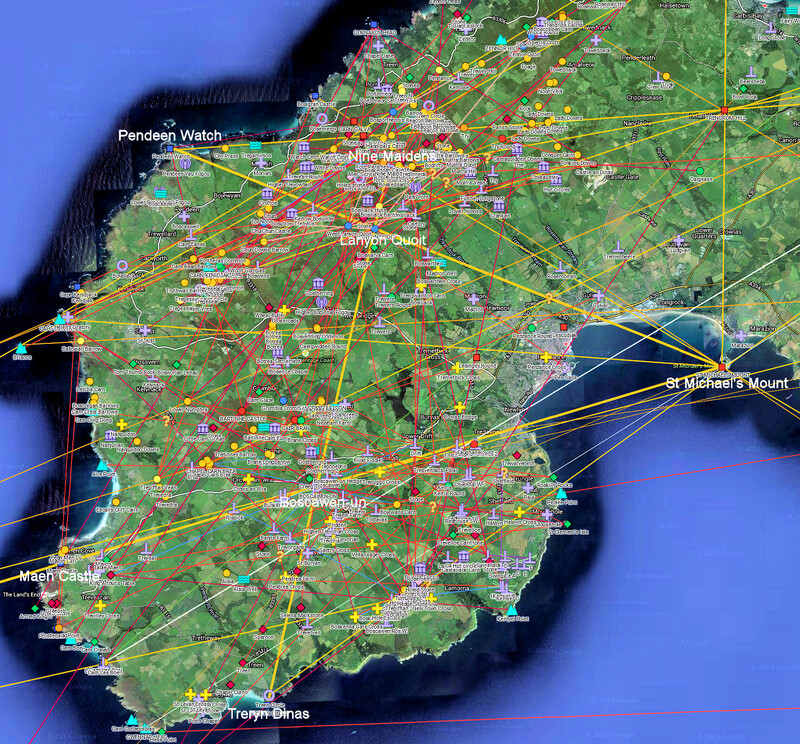 Since the backbone system is anchored in physical features (tors and headlands), this suggests that locations such as Boscawen-ûn and the other three stone circles might have been known and recognised back in the mid-neolithic, long before the stone circles were built in the later 2000s BCE - they are all located on backbone alignments. 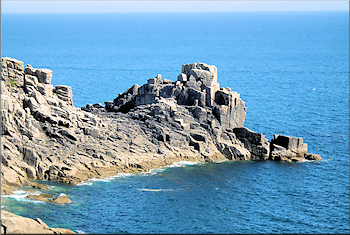 Boscawen-ûn is sited at a remarkable exact intersection of several alignments stretching between cliff castles around the Penwith coast, in some cases involving early sites. 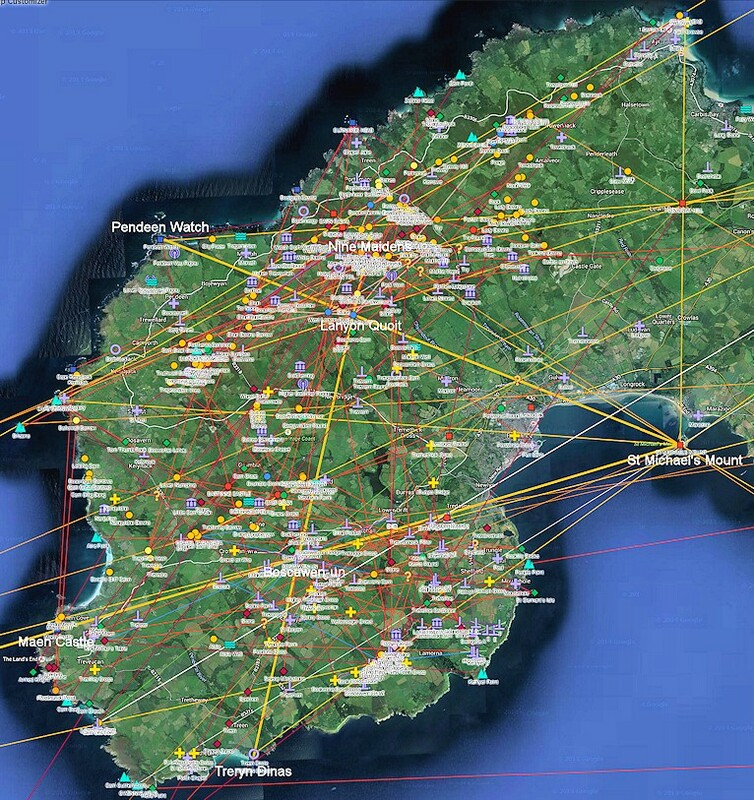 Later, in the 2000s, there was a propagation of the system, building a more localised and complex subsidiary network, greatly increasing the number of sites, virtually all of which were aligned to other sites. This process peaked in the period between 2500 and 1800 BCE - the classical era of the European Atlantic coast megalithic culture. It was a remarkable cultural upswing. All this suggests that a megalithic construction was not planned first, after which people looked for a good place to locate it. It suggests that sites such as cairns, barrows and standing stones were constructed either to establish a new alignment or to augment and strengthen an existing one. It might also suggest that, at least on some alignments, a series of sites along it was built at the same time - especially in the case of the menhirs in the south of the peninsula. In addition, attention was given to the system as a whole, spread across West Penwith. On the map, the red alignments (both lighter and darker red) are mostly from the bronze age, determining the location of bronze age sites such as cairns, stones and menhirs. These red alignments show the scale of proliferation of alignments and sites in the later 2000s. But the key point here is that the idea or the need for an alignment came first in bronze age people's minds, and the sites, as a means of pinning it down, came next. The starting intention was presumably to augment and amplify the reality-fields in existing, naturally-rooted ancient sites, and a more complex system grew from there, gradually incorporating all parts of the Penwith peninsula. The megalithic era as a whole lasted from 3700 to around 1500, with its final demise around 1200 BCE. A lot changed and developed in that time. Elsewhere on this website it is explained how there might well have been a divide in this period, around 3200-2900 BCE, around the time of the climatic Piora Oscillation. If this is correct, it divided the megalithic era into two main phases - one neolithic (3700-3200, five centuries) and the other mainly bronze age (around 2500-1500, ten centuries). For comparison, the urban-industrial period we now live in has lasted around 200-250 years. Up to around 3700 BCE, people lived lightly and inconspicuously on the land, without being the dominant force in nature that we humans later became. They were hosted, even swamped by nature and they were subject to its fluctuations. Hilltops, trees, rocks, cliffs, wells and glades were their special places. Wood, stone and organic items were their materials. They had considerable knowledge, skills and teamwork capacity, as demonstrated in the engineering of the quoits, built around 3700-3400, but they seem not to have had the wish or the need to live a more materially advanced and sedentary life than the life they had. Enveloped in nature, by degrees they were overwhelmed by its scale and its enclosed, mostly forested character. They had to walk everywhere, and a mile in dense woodland is a long way. They created clearings but, if not maintained, the clearings would re-grow. Hilltop tors and coastal headlands were therefore important - places where people could get some space and perspective, above and outside the woodlands. The ancients of that time still lived relatively lightly on the land, as horticulturalists, gatherers and fisher-hunters, following an annual round of their territories. Their monuments were of stone but most of their living spaces were of wood, cob and thatch. They kept their lives relatively simple because they seemed to see little point working their socks off with material complexities when life was okay as it was - the farming that came later increased their workload tremendously. Yet they had sophisticated interests, science and contacts nevertheless. They were tribal, but the spread of megaliths across Britain shows that inter-tribal relations were good and friendly interactions took place with people far away - Britain's megalithic culture shows signs of being a united nation. Perhaps, as in the iron age, a pan-tribal class of druids, craftspeople, ovates and bards existed, binding together people who were stretched across the megalithic world from Portugal to Sweden - and Penwith was a key node at the centre of this world. By the later 2000s, humans were clearing more land, heaving big stones around, constructing and re-shaping things, making more of a permanent mark. In the neolithic there had been one-acre clearings in the forest, but in the bronze age increasingly there were clumps of woodland interspersed across wider cleared areas. Those cleared areas became human space, made by humans and 'owned' by them. Our ecological footprint was increasing but, at this stage, not impacting fundamentally. Human impacts increased around 1500 BCE and in the late bronze age following it, with the permanent expansion of cleared fields and pastures, walled and improved fields, buildings, drainage and capital improvements. This was partially a response to a deteriorating climate, and partially a psycho-social moving on from former times. Increasing amounts of timber were consumed for metal smelting, construction and household consumption. The ancient field systems of Penwith, such as those around Zennor, were established from around 1500 BCE onwards, as the megalithic period dwindled - by now the megalithic worldview was more a tradition than a development programme. This period of cultural and material change at the end of the megalithic period was one of the big social, cultural and material changes in British history. The former preoccupation with sacred landscape engineering shifted into a preoccupation with farming, wealth creation and social status. Social drinking, weapons, horses, stock-improvement, early forms of private property and inheritance all came into being. It was a time of material innovation for the people of Penwith. Tin, copper and gold were exchanged for tools, food, crafts, ornaments and other gifts from far away, and early forms of employment, trade and patronage were established. Late bronze age people also built up a worldview that was increasingly human-centred and, amongst elites and tribes, stratified into pyramidal more than the earlier circular power systems. But this socio-cultural development also killed the megalithic age. Maturing and beginning to ossify after the 1800s, by the 1500s it was becoming more peripheral in people's priorities, and the culture, the faith, was losing momentum. Cultures decline because they cease answering the needs of the time, or they are superseded, or their time passes, and somehow the megalithic culture gradually lost the plot. It finally died around 1200 - the author's date-dowsing survey of Penwith puts it more exactly in the 1180s BCE.